In order to survive and even thrive in our information age, Andy Crouch believes the church must become more like a family, and the family must become more like a church. His new book, The Tech-Wise Family: Everyday Steps for Putting Technology in Its Proper Place [review], explains how wise, discerning handling of new-media technology will cultivate wisdom and courage. The home, he says, must limit technology in order to delight in God, neighbor, family, and nature. The church, he says, will not enjoy authentic community unless it disciples Christians in countercultural living when it comes to our TVs, video games, and smartphones. Crouch joins me on this episode of The Gospel Coalition Podcast to discuss his new book, published by Baker with new insights and research from Barna. For more than 10 years, Crouch was an editor and producer at Christianity Today, where I got to know him. He served as executive editor from 2012 to 2016. He joined the John Templeton Foundation this year as senior strategist for communication. 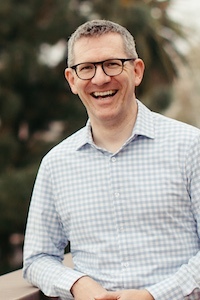 He is the author of several other books, including Strong and Weak: Embracing a Life of Love, Risk and True Flourishing [review], which won TGC’s 2016 book award in the category of faith and work. I spoke with him about parental peer pressure, family singing, Amish living, and more.